“A meeting place”, if you’re wondering what “Tagpuan” means in English. 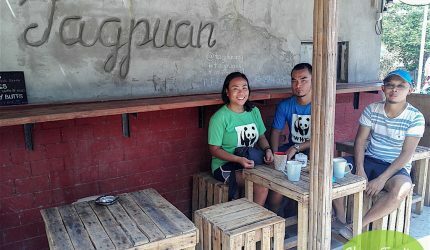 Tagpuan sa San Juan, the humble street corner eatery with a couple of tables and crates as chairs serves cheap comfort eats from kansi, goto to tapa and more. We weren’t actually looking for a meal that morning since we had breakfast but was delighted they serve real brewed coffee. Yes, not the instant 3-in-1 kind we had earlier. Even with the sweltering heat, I savor the warmth of a quality brew. I’ll take it any day warm or cool. 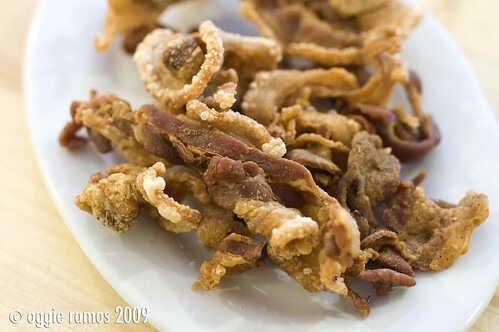 But what made is visit this unpretentious eatery is not only for the food but their unique movement for the La Union community. The newspaper headlines. Global recession. Inflation. Times like the present calls for some relief. Now more than ever, we ought to get comfort where we can find it. If it’s spa for the body and music for the weary soul, then it’s comfort food for the weary spirit. So when we heard of PenPen, we took a chance on the Saturday traffic and went to Timog for a late lunch for a serving of comfort food. The place has received some media mileage owing to the fact that it is owned by the wife and son of veteran actor, Pen Medina (hence the name, PenPen), but we want to find out if the comfort food lives up to the publicity.